The team at SageTV continues their constant stream of new beta releases for SageTV 6.5. A little over a week ago they released 6.5.13 which added closed captioning to its list of treasured features along with several additional new features and bug fixes. While I probably won't use this feature all that much, it will be very nice for those that are hearing impaired as well as for those who need to turn down the sound at certain times. I'll use it to show sports when I have company over but want to play music while the game is on. I tried this out with my Hauppauge PVR500 tuner and SilconDust HDHR tuners. It could work with the Hauppauge HD-PVR also, but since Hauppauge hasn't added that feature via a driver update, the HD-PVR doesn't support closed captioning yet. 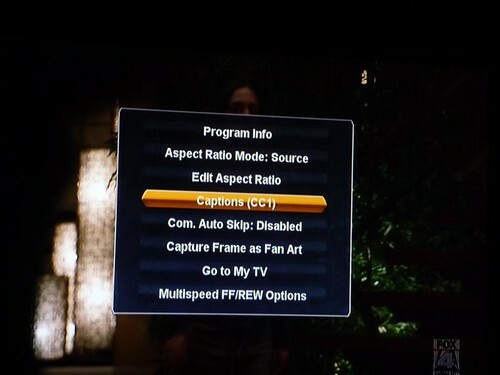 Closed Captioning Support! (EIA-608 style) For the HD200, LAN placeshifters and the MacClient. (placeshifters and MacClient only support NTSC currently, they'll be adding ATSC/QAM shortly; the HD200 already does all of them; and this has always been possible on the PC version on Windows, it just wasn't exposed by default) - requires beta firmware update on the HD200. Closed Captioning support for other SageTV devices will be added in future beta updates. Picture viewer: when entering this menu, delay starting next image preloading thread if not in a slideshow so the next image is not almost immediately preloaded.